Allegiant Air continues to capitalise on US major airline consolidation through a continued push from Cincinnati, a hub with diminishing importance within Delta Air Lines’ network. By late 2014 Allegiant is set to offer roughly 18 weekly flights from Cincinnati, and has indicated the airport could become a base for the airline. It is a rapid plan of expansion for Allegiant, which only initiated service from Cincinnati in early 2014. Cincinnati is a unique opportunity for Allegiant, which largely shies away from major expansion at network airline hubs. But the market seems to be responding to Allegiant’s low-fare leisure product that for now does not seem to be sufficient to annoy Delta into a response. Allegiant introduced its first services from Cincinnati in early 2014, and presently serves Orlando Sanford, Punta Gorda, St Petersburg and Myrtle Beach with twice weekly service. Beginning in Oct-2014 Allegiant is adding four weekly flights to Fort Lauderdale and two flights per week to Phoenix Mesa Airport while increasing frequencies to Punta Gorda, Orlando and St Petersburg to four times weekly. Four weekly frequencies is low for a typical network airline, but Allegiant’s model is built on low-cost and low frequency flights from large leisure destinations to small US cities. For Allegiant, four weekly frequencies is the upper end of its flight schedule; most of its destinations feature only two weekly flights per week. The increase to four weekly flights on its existing year-round service from Cincinnati (Myrtle Beach is seasonal) and the addition of new service to Fort Lauderdale with four weekly flights would indicate that Allegiant is recording reasonably good results on its still-young flights from Cincinnati. Allegiant is also competing directly with Delta on service to Fort Lauderdale. Delta also serves Orlando International from its Cincinnati hub and offers seasonal flights to Phoenix Sky Harbor International Airport. Even as Delta still considers Cincinnati a hub, its size within the airline’s network has diminished considerably since the Delta-Northwest merger. 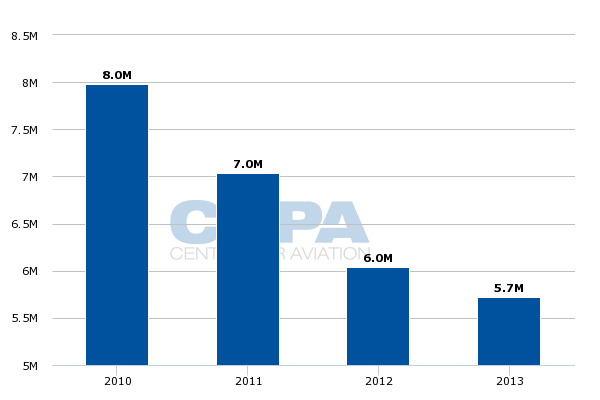 Between Jun-2012 and Jul-2013 Delta’s daily departures from Cincinnati fell by 10%, and presently (the week of 14-Jul-2014) Delta offers roughly 107 daily departures from Cincinnati. Delta officially de-hubbed Memphis in 2013, and Cincinnati could still be subjected to the same fate as Seattle becomes more prominent in Delta’s network. Delta is building Seattle into its main Asian gateway, and at the same time Delta is rapidly adding domestic flights from Seattle to increase its feed to long-haul markets and expand its overall footprint at the airport. Even though Allegiant is rapidly expanding in Cincinnati – the airline states that Cincinnati is its fastest growing origin city in its 15-year history – Delta obviously remains the largest airline in Cincinnati by a wide margin. It still holds a commanding 67% seat share in Cincinnati. Allegiant’s rapid rise in Cincinnati reflects its growing scale. Previously, the airline has stated that a few years ago Cincinnati may have been too large a market for Allegiant to link to its larger leisure bases. 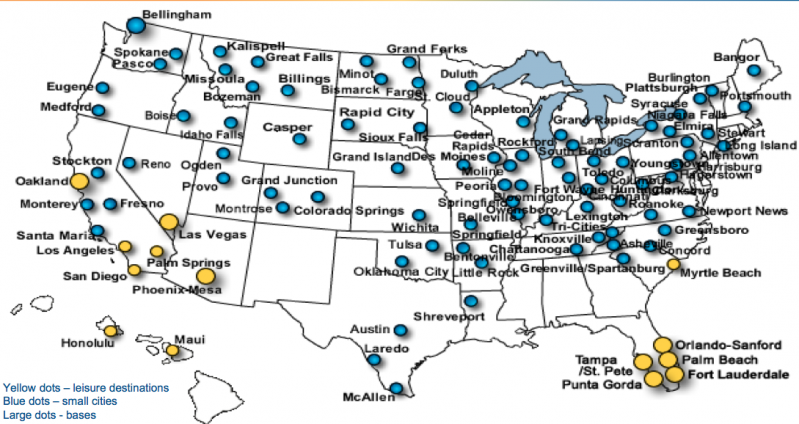 More typical cities for Allegiant are smaller markets such Casper, Wyoming or Grand Junction, Colorado. But Allegiant executives explained that as the airline has grown in scale, Cincinnati has become more viable, perhaps also since as a whole Cincinnati has seen its annual passengers number drop from eight million in 2010 to 5.7 million in 2013. Allegiant is still a fairly small airline comparatively, as it expects to have 70 aircraft by YE2014 – 53 MD80s, six Boeing 757s, four Airbus A319s and seven A320s. 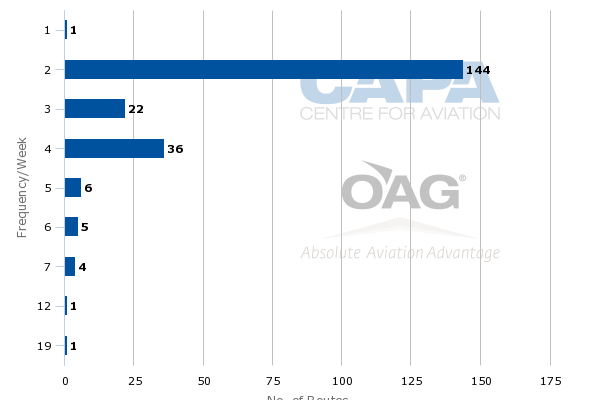 It has previously estimated year-on-year fleet growth of 6% in CY2014 and 11% in CY2015 as its A319 fleet grows from four to 10 and two additional A320s come online. Allegiant’s growing scale allows it to consider larger markets, and its low-frequency service is lower-risk since the airline can quickly pull out of a route if it under performs. At this point Delta is also leaving Allegiant to its own devices in Cincinnati. Given that Allegiant’s model is different from other ultra low-cost airlines (other ULCCs tend to operate with higher frequencies), it does not seem that Delta has any risk of losing passengers to Allegiant. The targeting of lower yielding passengers by Allegiant is a built-in buffer against the few large network airlines Allegiant encounters. Delta’s service reductions in Cincinnati allows Allegiant to add a larger market to its network roster while preserving its strategy to largely avoid competition with other airlines. 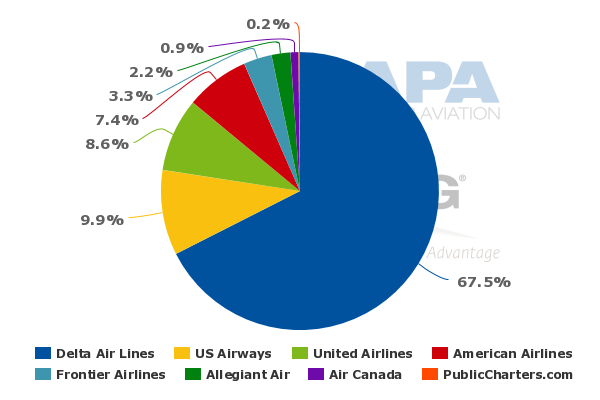 As of May-2014 Allegiant estimated it had 218 routes with no competition and 20 with competitive overlap. It competes with Southwest on the largest number of routes at 11. Southwest does not really pose a huge threat to Allegiant since Allegiant’s fares are lower than Southwest, and Allegiant does not compete for passengers based on schedule. Allegiant executives recently told the Cincinnati Enquirer that the airline believes it can become larger in Cincinnati, hinting that the airport could become a base for the airline. Allegiant explained it would likely need to operate 20 weekly flights from Cincinnati to examine if a base is viable at the airport. Once the airline launches new and expanded service in Oct-2014 it will offer approximately 18 weekly flights from Cincinnati. Allegiant’s decision to enter the Cincinnati market and then expand so rapidly in such a short period of time is perhaps one of the most relevant examples of a smaller airline capitalising on US consolidation and the resulting shrinking of smaller hubs as the economics of those airports under a hub scheme become unfavourable. Frontier Airlines has also executed a similar strategy in Cleveland after United concluded a 60% reduction in departures at its hub in Jun-2014 - although Frontier is not backfilling a significant amount of markets that United has dropped. The prime opportunity that both Allegiant and Frontier see in Cincinnati and Cleveland is an ability to stimulate traffic. Even as Delta has slowly pulled down Cincinnati it has remained one of the highest fare airports in the US (based on data from the DoT), ranking second during 4Q2013 with an average domestic fare of USD510. Cleveland was the ninth highest priced airport with average fares of USD458. Neither airline will or has aspirations to replace the service lost in Cincinnati and Cleveland; but with some passengers priced out of the market, their low-fare proposition is attractive without making a full-blown assault on the network airlines that still dominate those airports. The shakeout in the US market place will continue to open up opportunities for smaller airlines to exploit the cuts the network airlines are making as they strive to make their networks more efficient and profitable. Frontier is already building up its presence at Washington Dulles as some are questioning the airport's hub viability within United’s network. American is just beginning to brush the surface of the potential offered by the combined American-US Airways network; so there is likely to be more rationisation in the new American’s collective route offerings. There are no indications of just how Allegiant aims to position itself for those opportunities in the long term. But its quick build-up in Cincinnati shows a certain nimbleness in seizing on opportunities as they arise. The trick is making those opportunities profitable. Given Allegiant’s track record, it has good odds of achieving success in Cincinnati. And Frontier will also be making its presence increasingly felt as these low cost operators move to exploit the price conscious underbelly of the US travel market.